Silver.925 harmony ball with a matching cut-out hearts medal in genuine silver. Delivered with a black cord. 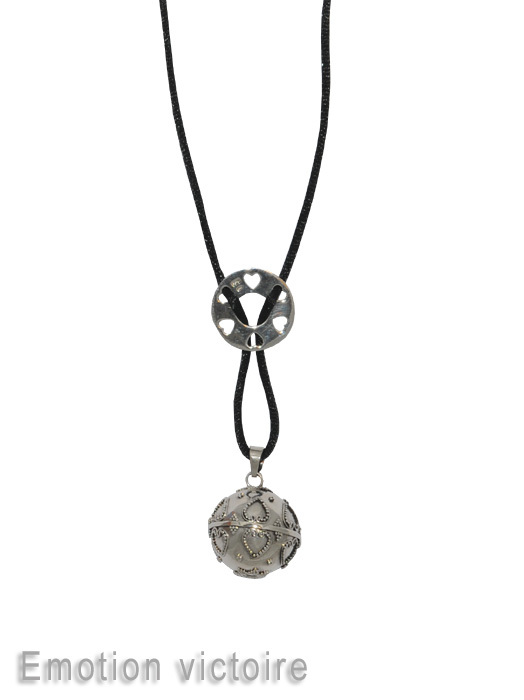 A bola necklace with charms resolutely trendy and stylish. This chime ball is a real jewel for pregnant women ideal for all nine months of pregnancy. Whatever you wear, the bola necklace will provide the final touch. The Harmony ball is a jewel that rests on the pregnant woman’s belly and the chime ball emits a soft tinkling sound heard by the baby from the 20th month of pregnancy. The Emotion line gives an original touch to the pregnancy necklace. A unique gift for moms to be !